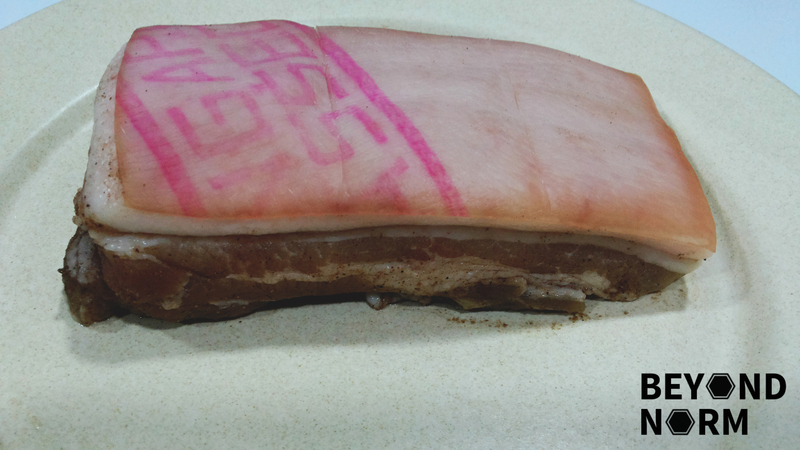 My family loves roast pork and when I came across this new way of making this dish, I was certainly skeptical. Why? Using milk and wine, and best of all… No poking involved!!! I have tried this method several times and each time it yields a perfect crackling. It is important to make sure that the skin must be DRY, DRY DRY!!! 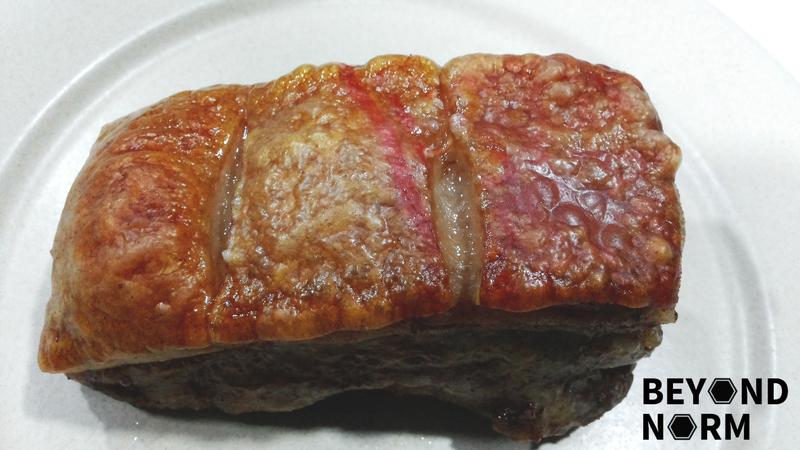 The crackling was still crunchy after a couple of hours. 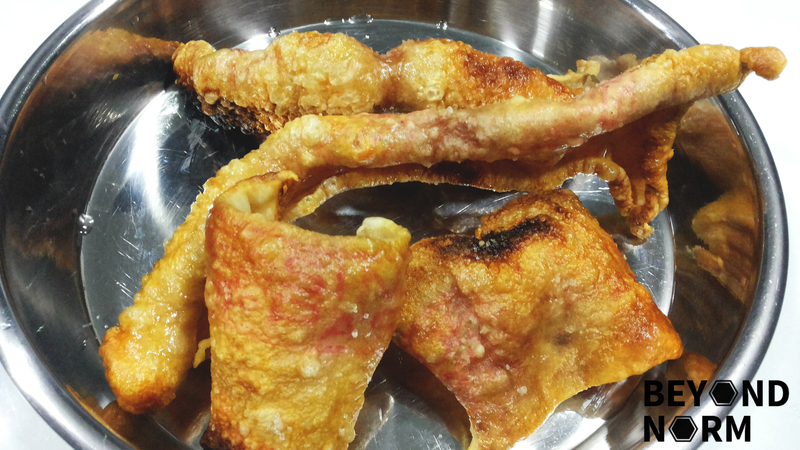 I have even used pork rinds only to experiment on this method and I have shared a photo of the crackling on some Facebook groups which has aroused a lot of interest on how to cook it. This is why I am so happy to share this recipe. Try it, you will definitely not regret it. 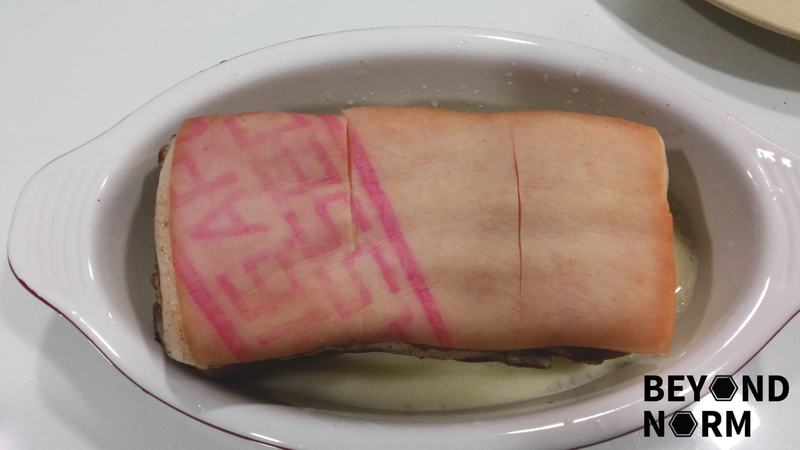 Rinse pork belly slab and pat dry with paper towels. Make sure the whole slab is DRY. 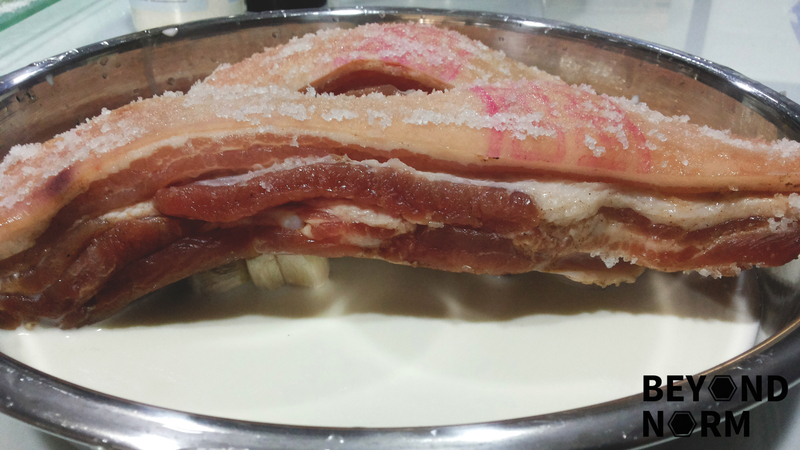 Combine the seasoning for the meat in a small bowl. Rub the marinade all over the meat portion only. If any marinade gets on the skin, rub it off with a paper towel. This is an optional step. Score the skin across with a sharp knife (not too deep), about 1 cm apart. This will make the cutting easier after the meat is cooked. Rub the oil on the skin. Rub sea salt on the skin until you see a visible layer on top. Then pour in the milk and white wine. Place the pork on top of the garlic. Make sure the skin does not come in contact with the liquid. The belly flesh, however, would be immersed/in contact with the liquid at this point. 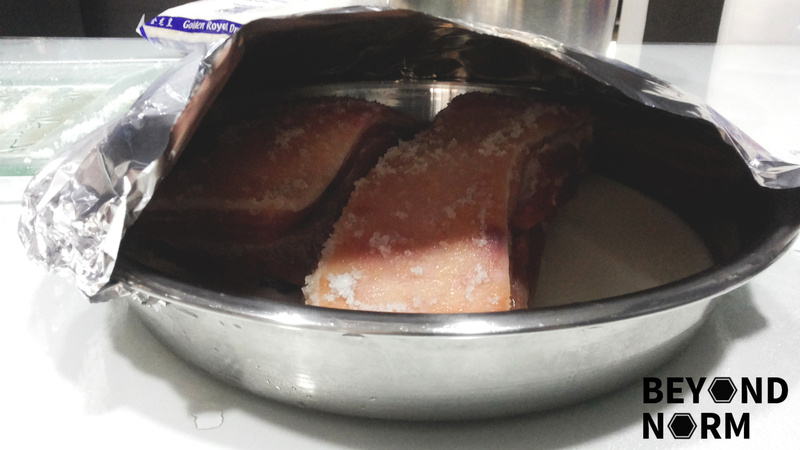 Cover the baking tray with aluminum foil, making sure the tray is tight but doesn’t touch the skin of the pork. 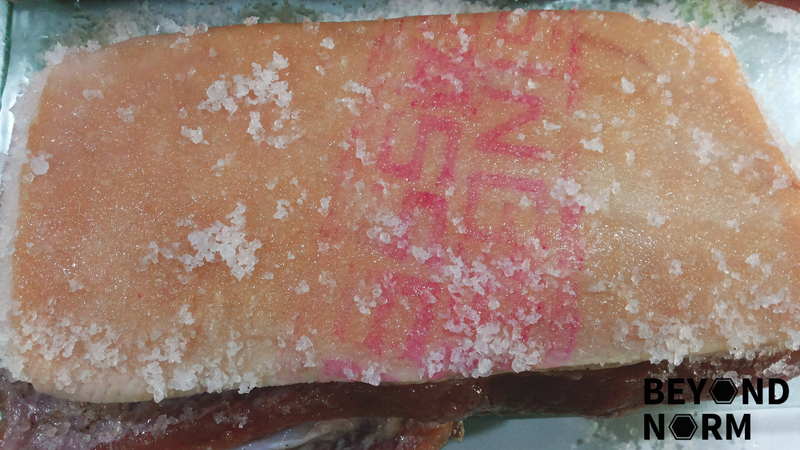 Otherwise, salt won’t dissolve and will form a salt crust instead of crackling. Bake in oven for 2 hours. After that, remove the foil and increase the heat to 240°C. Bake for a further 20 to 30 minutes or until skin has completely crackled. Remove meat from tray and leave it to rest for 15 minutes before carving. Serve with chilli sauce as mentioned in my earlier Roast Pork recipe. Rubbing the rind with a little olive oil aids in the quest for crackling. Rubbing the salt into the rind is to draw the moisture out of the rind, enabling crisp crackling. You may use either 1 cup of wine or 1 cup of milk according to your preference. Sitting the pork on a bed of garlic just does something magical to the flavours. 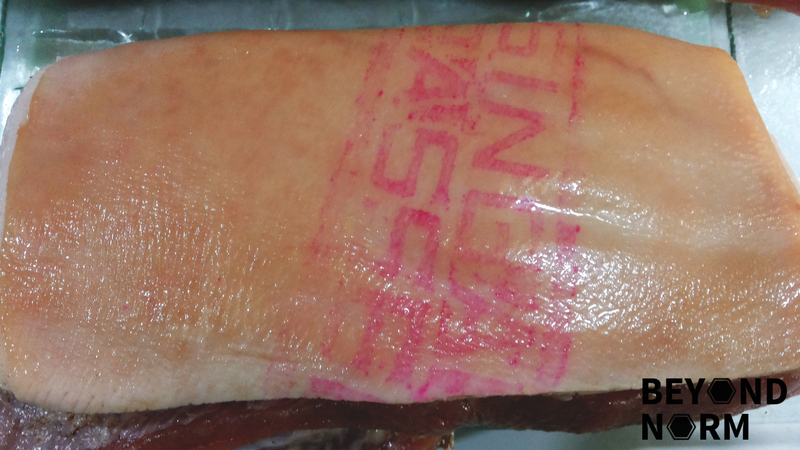 If you can buy some extra rinds from the butcher, this will be a bonus for yourself and your guests. Apply Steps 1, 4, 7 to 8. Use a bigger tray if you are baking with your slab of meat. 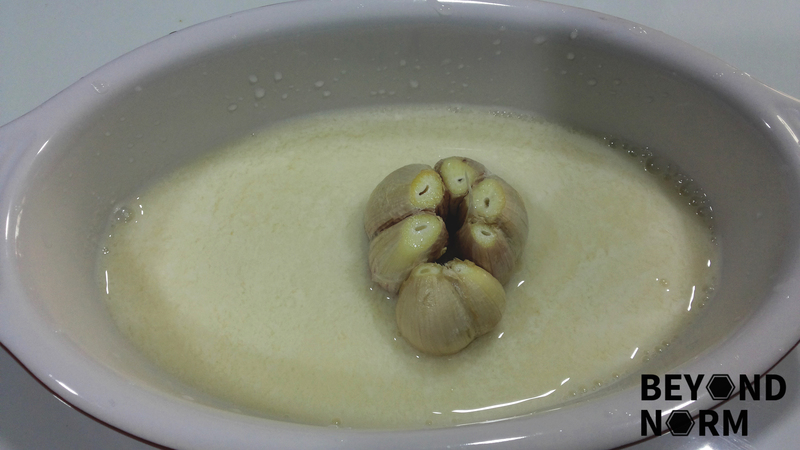 Add more bulbs of garlic to ensure that the rinds sit on top of them and do not touch the liquid. Hi, thank you for the interesting recipe. May I ask, what is ‘making sure the tray is airtight but doesn’t touch the skin of the pork.’ This refers to the baking tray ? Make it airtight using the aluminium foil ? 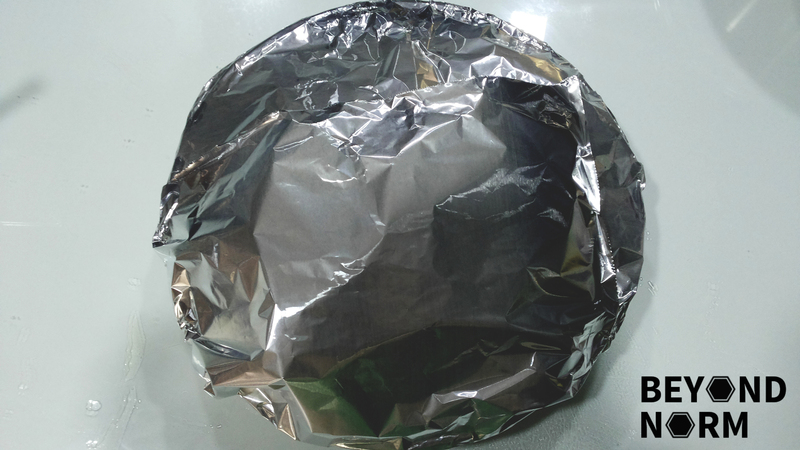 Do you still need to wrap with foil during 2nd round of baking? Hi, can I just use wine instead of milk and wine as we have family members who does not like the smell and taste of milk. ? Thank you. Hi Linda. You can just use the wine if you do not want to include the milk. 🙂 Happy cooking! Hi, can I just use milk without wine? Thank you.